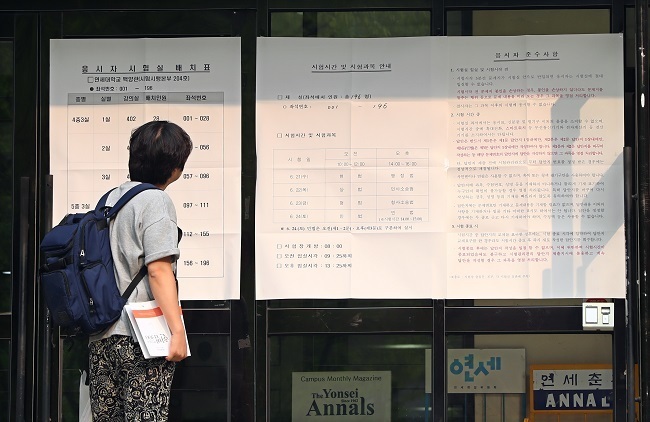 Hundreds of people, many with their eyes fixed on books, hurriedly walked past the main gate of Yeonsei University in Seoul on Wednesday morning to take the “exam of destiny” -- the nation’s very last state bar exam. If their efforts pay off, spanning several years, they will advance to the final round of the three-stage exam -- an interview -- to become a legal professional in the country. Only 50 people will pass this round. Following the exam, which will continue until Saturday, there will be no more opportunities to enter the legal profession through written tests that have nurtured more than 20,000 legal professionals -- lawyers, prosecutors and judges -- in South Korea over the past 54 years. “I feel sorry for myself as it is my last opportunity after all these years of studying,” Kwon Ho, 40, who has been preparing for the bar exam since 2000, told The Korea Herald during a lunch break on campus. Many of the test takers have prepared for the bar exam for years despite its scheduled phasing-out, refusing to be enrolled at costly law schools for three years to qualify as a legal professional. The bar exam was first introduced in 1963. In South Korea, the state-administered exam has long been a symbol of “fair competition” and a “rags-to-riches” story as a rare chance to climb up the social ladder for anyone regardless of their academic, family and regional backgrounds. Under the system, those who pass the traditional bar exam receive training at the Judicial Research and Training Institute before practicing law as lawyers, prosecutors and judges. “Law schools’ tens of millions of won in tuition fees hinder fair competition among candidates, making it virtually impossible for poor, ordinary citizens to seek legal careers,” said Lee Jong-bae, 39, a representative of bar exam takers. “Even after students graduate from law schools, the name values of their schools affect their future careers and those with powerful parents tend to get more advantages,” Lee claimed. Rep. Oh Sin-hwan of the main opposition Liberty Korea Party last year proposed a bill to maintain the bar exam. It is currently pending at the Assembly. But the prospects of the passage of the bill appear grim. The Constitutional Court ruled in September last year that the abolishment of the bar exam was constitutional. President Moon Jae-in -- who also become a human rights lawyer through the bar exam -- openly expressed his support for its abolishment. A US-style law school system was introduced in 2007 under the late liberal President Roh Moo-hyun -- who himself was a human rights lawyer after passing the state bar exam -- to stem prevalent academic elitism in the legal circle. Though the exam was open to anyone regardless of academic background, the exam passers tended to be law students from a few prestigious schools, instigating the creation of school-based cartels. Under the system, 25 law schools were set up with an aim to draw aspiring legal professionals equipped with varying experience and backgrounds and increase the number of lawyers to improve the quality of legal services through competition. Only those attending the law schools are entitled to an attorney-qualifying exam at the end of their three years of study. But the law schools, which cost students on average of about 50 million won for a three-year course, have been accused of being too expensive and lacking transparency and fairness in their admission process. Their opponents claim the law schools only benefit the privileged and discriminate against candidates by age, family and academic background when accepting students. Some of the lawmakers and high-profile figures were embroiled in controversies in the past for allegedly pulling strings to help their children secure entry into prestigious law schools. 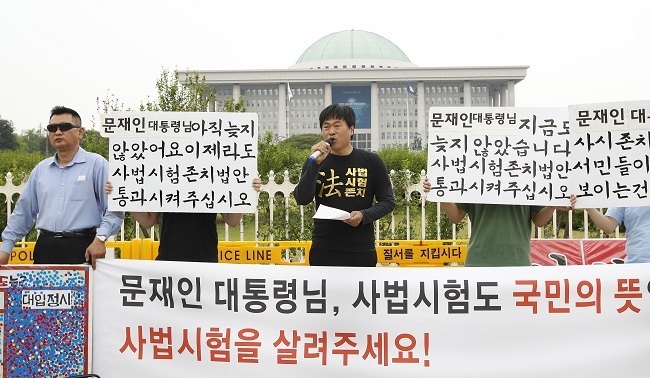 Lee Ho-young, spokesperson for Association of Law School Graduates, refuted the bar exam proponents’ claims that law schools are taking away opportunities from low-income households. The Education Ministry made it possible in January for the bottom half of the income bracket to have up to 70 percent of their tuition fees covered by scholarships to relieve the financial burden in attending law schools. “But we agree that law schools’ admission process should be reformed and measures should be enforced to get rid of irregularities in the process,” he added. As the controversy persists, bar-exam proponents argue the bar exam should be administered, too, while the law school system is in operation. “I am not saying that the law schools should be abolished. The bar exam should be in operation so that the two-way system can keep one another in balance through competition,” the bar exam takers’ representative Lee said. Rha Seung-chul, a lawyer and former head of Seoul Bar Association, said that there should be a separate exam to screen candidates. “For those who are unable to afford tuition fees at law schools, there should be a separate exam – not necessarily a bar exam – to grant those selected qualifications,” he said. But law school advocates point out it is inefficient and goes against its original purpose of establishing the law school system.